As we near the end of summer, it is the perfect time to begin considering winter preparations. Some animals look for places to hibernate in the winter, especially in climates that drop to freezing temperatures. Other critters are simply looking for a respite from the cold, as well as a constant food supply. A garage can be an enticing option that offers animals shelter from the elements and potential dangers, and occasionally food and water sources as well. 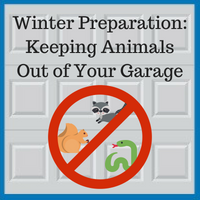 Snakes, raccoons, squirrels, and other unwelcome wildlife may find their way into your garage if you are unprepared, potentially having a negative effect on the investment you have made in your home. Raccoons do not hibernate, although their body functions do slow, and they become less active during the winter. Raccoons take naps that can last up to several weeks. However, their state of torpor breaks periodically, and the critters leave their den in search of food. It is common to find raccoons in attics, garages, pools, and garbage cans. Although they may appear cute, it is ill-advised to feed them, as they can carry a wide variety of diseases and often cause severe damage to homes. Raccoons are notorious for leaving droppings, chewing wires and insulation, and ruining home structures. Keep trees trimmed and away from your house, because raccoons like to stay close to their typical home environment when creating a new den. Check your garage for signs of ripping or tearing, especially in places where the eaves meet up with the roof of your home. Also, watch for entry through soffit vents, gable vents, and other roof vents. Raccoons are strong enough to rip through shingles and siding if they want in badly enough. Remove food and water sources by keeping pet food in sealed containers or inside your home, and be sure to secure trash can lids firmly. Squirrels do not hibernate either, but they do slow down during extreme cold. The main agenda of the squirrel is to find food for today and to store it for later, regardless of what stands in their way, including your garage. Make your home less tempting by removing the food incentive. If you have fruit or nut trees in your yard, clean up any fruits that have dropped on the ground. Keep all food inside your garage in an airtight container to reduce scented attractants. Deter these pests by sprinkling entryways with strongly scented spices, such as cayenne pepper or chili powder. Squirrels also avoid the scent of peppermint, so diffusing peppermint essential oils can reduce their interest as well. Snakes do hibernate in the winter due to their cold-blooded nature. These reptiles particularly enjoy cool, damp, and protected places, so your garage or the walls of your house make an ideal home. Snakes are attracted to water, so if you have a pool, live near a lake or stream, or water your lawn often, snakes will find your home even more inviting. Reducing the number of times you water may help keep the snake population from residing in your vicinity. Other tactics include reducing the food supply, repairing any holes or openings where snakes may enter your garage, and keeping your garage clutter-free to reduce the number of hiding spots. We hope these tips and tricks help you keep wildlife out of your garage. If you are looking to improve your garage, Blue Sky Builders offers free garage estimates upon request. 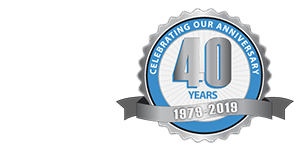 We have 39 years of experience assisting clients in and around Chicago and DuPage County. Contact us online or call us at 630-852-8485. To see some examples of the garages we have built, please view our garage gallery.